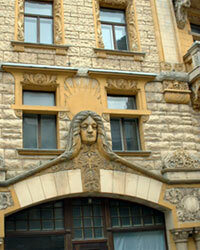 There are certainly a number of reasons why you should visit Riga, especially in springtime. You could do it for recalling the atmosphere of an medieval Hanseatic city at the Baltic coast, or explore one of the most important cities of the Swedish Baltic empire in its time (17th century). Or why not admire the beauty of the magnificent art nouveau architecture of a previous turn of a century together with the hectic street life of the modern Riga. It is all there - and worthwhile visiting several times. I myself was revisiting Riga at the end of last month on the invitation of Mr. Janis Holsteins, Director General of the Latvian Television, for a planning meeting. The invitation referred to the successful Riga Baltic Audiovisual Archive Conference and the explorative discussions at that event to form a permanent Baltic cooperative body in the audiovisual archiving area. I say revisited, since I was invited to give a couple of presentations at the 2004 Riga Conference together with a number colleagues I also met at this planning meeting. There was of course our brilliant conference organizer, from our host organization, Latvian Television, Nora Licite and Andris Kesteris of the Library and Archives Canada together with Tedd Urnes of the NRK. The latter both inexhaustible inspirers and skilled organizers when it comes to international audiovisual archiving events in general, and Baltic ones in particular. There was Rasa Miskinyte, producer from LRT in Vilnius, Vilnis Auzins of the Latvian Museum of Photography and Ivi Tomingas from the Estonian Film Archives. The reason for this "name dropping", apart from having met these colleagues already last year, is to emphasize the depth of the representation of Baltic and international audiovisual archives present at this planning event. So maybe, it is not a coincidence that we a shared a meeting place at the restaurant, Raibais Balodis, Latvian for "the speckled pidgeon", as a methaphor for this diversity. Mr. Holsteins was unfortunately prevented from coming to the opening of the meeting, but was, on behalf of the Latvian Television, represented with a hearty welcoming by Andris Kesteris. The meeting was chaired by Tedd Urnes who began by giving me the floor, since I had been invited to give a short and - hopefully provocative - presentation on the topic: "Why are we doing all this conferencing and networking, what is it good for?. I chose to give it the heading "Why re-invent the wheel? ", since it is a vital discussion, especially in an audiovisual archiving world of tight budgets. Is it worthwhile for our organizations to be investing in this kind of acquisition of knowledge? I tried to give a list of positive arguments for this. You can check it out yourself by clicking on the picture here. The aim of this meeting was twofold: Find out whether it is possible to establish a Pan-Baltic audiovisual archiving cooperative organization and organize a second Riga conference in fall 2005. The meeting spent several hours to give all the pros and cons an airing. Will there be people ready to accept the offices and responsibilities in the board of such an organization? How much work will it mean, that has to be carried out in addition to our usual responsibilities? How will the officers of the board be elected? How do we deal with the economy of the organization; funding, membership fees, bank account? Cooperation with already existing organizations on the audiovisual archiving scene? What will be the main objects of the organization? etc. As you understand, a great number of questions - crucial questions. A Baltic Audiovisual Archiving Council is born! Since the first Riga Conference was supported on the organizational level by the IASA Nordic Branch, we knew that IASA was ready to support a regional Baltic organization. The meeting decided to seek some kind of affiliation to the Nordic Branch. This intention was that this would also assist the financial administration. Participants, both on site, and those who could not be in attendance, generously accepted to take on the responsibilities of an interim board which was eventually named the Baltic Audiovisual Archival Council. The presidency was accepted by Piret Noorhani, Estonian Literary Museum. Vice Presidents are Rasa Miskinyte, Lithuanian Radio & Television and Inga Vilcane, Diena Library, Secretary Nora Licite, Latvian Radio & Television and members of the board Andris Kesteris, Library and Archives Canada, Tedd Urnes, NRK, Lasse Nilsson, SVT Planning/Archives. All other participants of the meeting signed up as members of the Council. A draft document of statutes was presented by Tedd Urnes and it was accepted as such until further elaboration at a coming membership assembly. The first working fields of the interim board will be to establish the cooperation with the IASA Nordic Branch, seek possible funding of the organization and seminar, and work out the conference programme for the fall. The rest of the meeting was dedicated to the fall conference. Andris Kesteris will provide you with more details on that, but I can disclose that professional training of audiovisual archivists, preservation and migration, rights and stills will be prominent issues on the agenda. Working with the SVT Archives since 1976, as archivist, manager Documentation & Research Dept., today Project Manager. | Former member of the FIAT/IFTA Executive Council, Chair of Programming& Programming Commission and Secretary General.